Customer satisfaction isn’t everything, but it’s hard to imagine a successful business that doesn’t take customer sentiment into strong consideration. 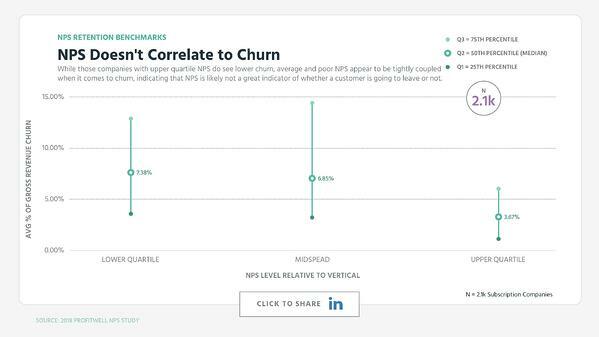 That being said, the cult following around customer satisfaction utilizing Net Promoter Score or NPS is admirable, but as we’ll see in the data, NPS is not infallible. On this episode of the ProfitWell Report, Chiraag Kapoor, Director of Global Service Operations at Datorama, asks us to look at the impact of Net Promoter Score on retention. To answer Chiraag’s question, we looked at data from two thousand companies and over ten thousand subscription consumers. As to not bury the lede, NPS, as an aggregate measure of customer satisfaction, is not a strong indicator of retention. 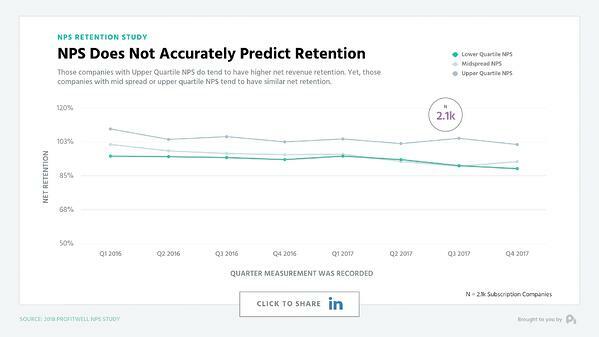 I know that's going to be shocking to the NPS acolytes out there, but when we look at the data, you'll notice that those companies who have an NPS score in the lower quartile or in the midspread of their industry have essentially the same retention with mild acceptable variations here and there. 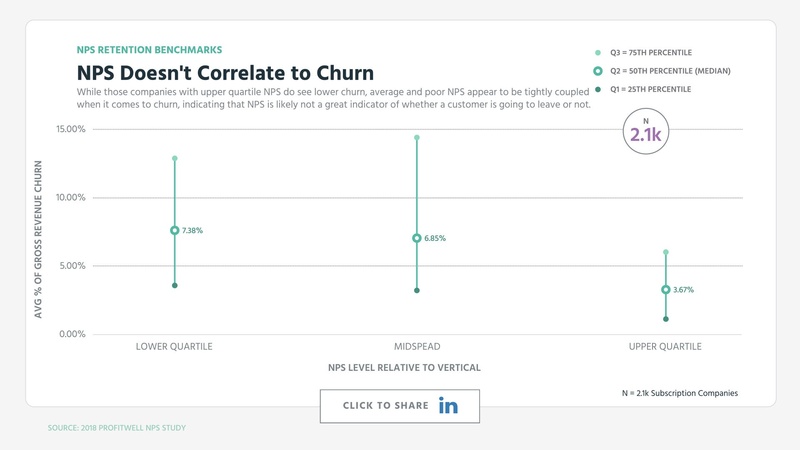 We broke out the striations of NPS across the spectrum and consistently the only indicator of any strong correlation in one direction or another is if your NPS was in the upper quartile of your industry. 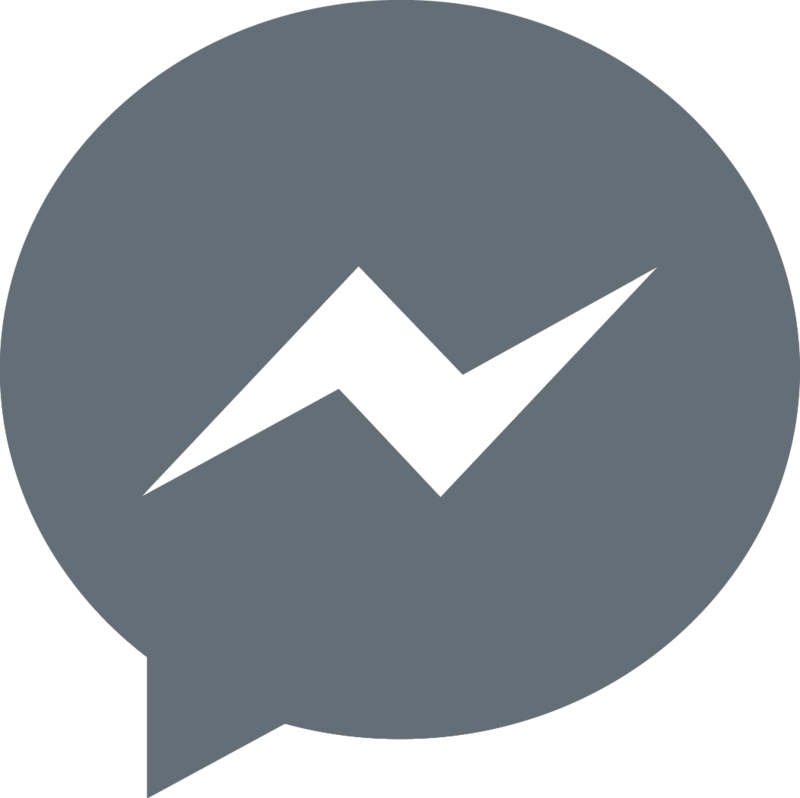 You then tended to have 5 to 10% higher retention on an absolute basis. Note that this trend is also consistent when you look at gross churn rate, where upper quartile NPS companies have noticeably lower churn, but median and bad NPS companies are essentially the same. 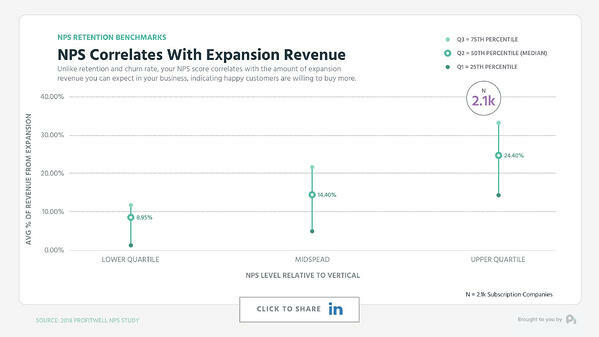 Things get interesting though when looking at expansion revenue, where as a company has higher NPS there is a stronger correlation to having more expansion revenue with lower quartile NPS companies seeing a median of 9% monthly revenue coming from expansion, the midspread seeing 14% and the upper quartile 24%. So what does this mean for NPS? Well, it means that in aggregate NPS is very much a reactionary metric that lacks enough sensitivity to be useful as a measure of momentum. 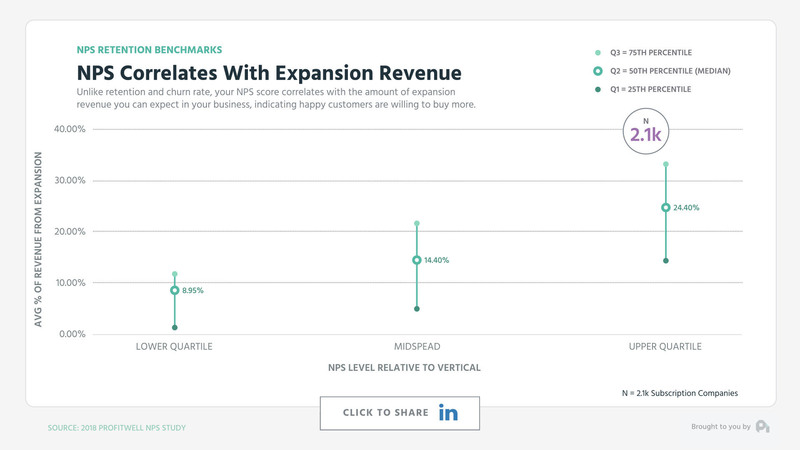 If you have high NPS, it’s great, but there’s likely a lot of lurking variables that contribute to your retention that NPS is simply measuring. This also means that if you have above average NPS it doesn’t necessarily mean you’re better off than a company with bad NPS, which is unsettling for our industries obsession with such an insensitive metric. 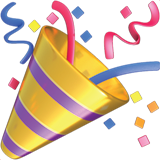 NPS is still useful, but likely only as a framework for identifying those customers on an individual basis who are raising their hands in frustration and as a blunt metric that when looked at in aggregate or on a segmented basis you want going up over time. 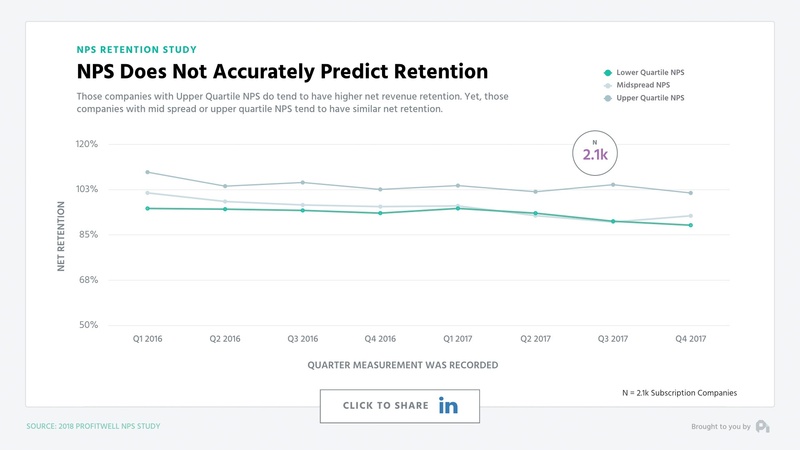 Put another way, collect NPS, but your actual financial and retention metrics are an order of magnitude more important. Well, that's all for now. If you have a question, ship me an email or video to pc@profitwell.com and let's also thank Chiraag from Datorama for sparking this research by clicking the link below to share and give him a shoutout. We'll see you next week.